Sometimes the enjoyment of a particular film almost guarantees I’ll go to see the sequel. Now You See Me 2 (2016) is no exception. I really liked Now You See Me (2013) because the genres of “magic” and “heist” merge so easily together. Now three years later, and I certainly looked forward to this sequel, despite not knowing how the plot could advance any further than it had at the end of the first film. While the sequel did not disappoint, with numerous illusions, plenty of action, and loads of comedy, it felt like it was the same old gimmick as the original. Sure, there was a little more exploration into “the Eye”, but most of the plot of the second film centered on the consequences of the robberies from the first film (almost weighing it down, in my opinion). The addition of Daniel Radcliffe as a winking nod to his Harry Potter character was fun as a reveal, but didn’t offer much in terms of plot development. In fact, I almost liked Woody Harrelson playing twin brothers more, but that’s likely due to the comedic value. Unfortunately, because Now You See Me 2 focused almost entirely on the background of Agent Dylan Rhodes (Mark Ruffalo), I felt it was held back to its full potential. None of the other characters really grew that much, but they were rewarded for working together (after running into a few snags), much like they did in their first appearance on screen. Don’t get me wrong, the formula works for me and I was entertained, but maybe this franchise would have been better served as a TV series instead of a potential film trilogy. 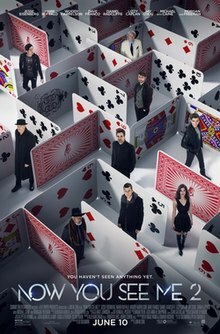 Still enjoyable with the same bag of tricks, I give Now You See Me 2 3.5 stars out of 5.